There is also a mobile version of the game, which is supported by both Android and iOS platforms, so the players can enjoy this amusing slot on their smartphones/tablets. The theme of the game is all about Venice. One can see Venetian buildings, gondolas and channels in the background as well as the festival mask used for the Piazza San Marco festival. Graphics are outstanding, every element is realistic, perfectly rendered and displayed in 3D. So realistic, that the welcoming screen looks like an actual oil on canvas painting of the sunset in Venice! 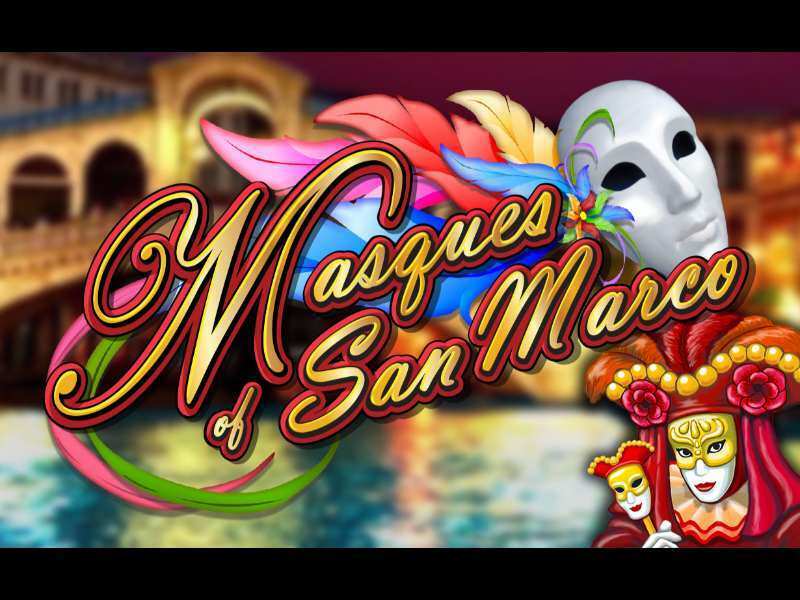 As for the symbols embedded in the Masques of San Marco online slot machine, they make a real masquerade! One can come across various types of festival masks and icons of the sun, the moon, and a star. The mask token with letter M is worth the most, for five of them placed in consecutive order on an active payline, one would score the jackpot prize of 5000x the amount of his bet! The wild symbol has the ability to substitute all icons, except for the scatter. This can help the player to complete his winning combination more easily.If one manages to land three or more bonus icons in the top or in the bottom half of the reels, he would activate the free spins feature in which the player gets awarded six costless rolls. During this feature, the dividing line in the centre vanishes and another 20 paylines get added to the game. Another interesting feature that will certainly attract the players to play free Masques of San Marco casino slot machine is so-called “collapsing reels”. Each time the player scores a winning spin, the symbols involved in the prize vanish in order to make a place for new ones that can potentially form another winning combination. Theoretically, this process can repeat infinite times, which can lead to some serious payoffs. One of the advantages of this game considering wager placement is a wide range of coin value. As said above, one coin can be worth between 1 and 50 credits. The maximal bet is 2000 coins. All wins get multiplied by bet per line and considering that there are 2 sets of twenty of them, it’s not hard to conclude that one can score up to 250000 coins in a single spin. Translated into real money, that would be around 12500$! And with “collapsing reels” feature and those additional free spins in bonus mode significantly increase the chances of scoring some serious payoffs! As for the interface and controls, it couldn’t be simpler. The player only gets to set the amount of his bet, click the “Spin” button and enjoy this entertaining online slot! A possibility to win up to 250000 coins per one spin! So, if now you feel determined to give it a try, you can visit Money Online Slots, where you can come across slots similar to this, such as Double Da Vinci Diamonds, which is also a Dual Play game. 0 responses to "Masques of San Marco Slot"